Back to School…Hit the Hay! My daughter returned to preschool this week. Last year, after struggling at bedtime and with her waking a few times every night, we moved her bedtime back to 6:30 and all of our problems were solved. (Granted, we did have to pick her up from school 30 minutes earlier than we had been, and we had to shift bath time to the morning.) This year, I thought, “Well, she’s older now and hasn’t gone to bed that early all summer…we’ll go back to a 7-7:30 bedtime.” Boy, was that a mistake! Margo clearly needs more sleep, especially when she’s using her mind and body so much more at school. After two days of total melt-downs around dinner time, my husband and I agreed that bedtime had to be shifted earlier again and, after one night, it worked! We all slept through the night and had a pleasant morning before school. Everyone was happy and I know that our daughter is much better equipped to deal with the excitement of learning. There was a fascinating article printed in NY Magazine a while ago that is worth reading. As our kids head back to school, we need to think about the importance of sleep and how it affects their ability to learn and develop. This article explains that even a short period of time (a half hour) can have a huge impact on our kids. The research indicates that for every hour of sleep lost, 2 years of cognitive and maturational development are lost. In addition, we learn from the article that a shift in sleep times (they gave the example of letting kids stay up later on weekends) also has a negative impact on ability to learn. Bottom line: our kids need sleep. 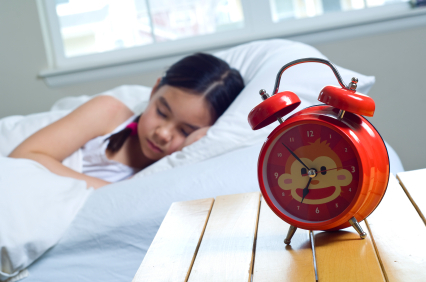 While we don’t like to give hard and fast numbers for how long your child should sleep, we have heard from pediatricians that school-aged children still need anywhere from 10-12 hours of sleep per night. Melissa and I have found that our children have a pretty large sleep need and our kids tend to do best when they can get the maximum amount of sleep possible. As parents, it is really important that we have consistent bed times and that we allow our children to sleep for as long as possible. If you have a child in school, it is important to maintain your routine even on weekends (when possible). Check out our Bedtimes by Age guidelines. Figure out what time your child needs to wake up in order to get to school on time and count backwards to find the suggested bedtime. Tell us what you think – are your kids getting enough sleep? Do they have trouble adjusting when going back to school? If you struggle getting your child to bed or find that he’s grumpy in the morning or throws tantrums in the late afternoon, give an earlier bedtime a try for a few weeks and let us know if you see an improvement.